Revised Second Edition DVDs match the Fourth Edition Text and Teacher's Manual. Produced by popular demand from parents and teachers, these DVDs simplify classroom prep time and show all the secrets and tricks that make learning Latin easy. The DVDS take the most popular Christian Latin program ever and make it even better. 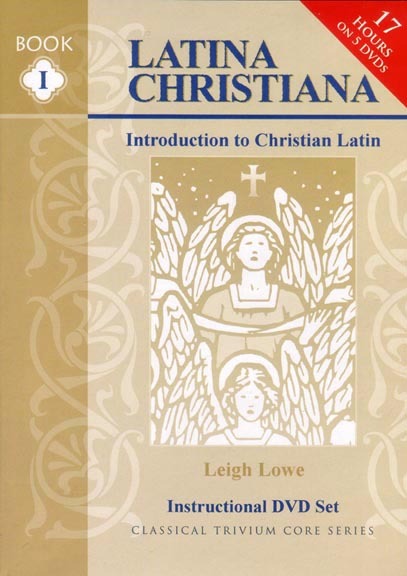 Latina Christiana I DVDs are taught by Leigh Lowe, one of the most popular teachers at the Highlands Latin School. Mrs. Lowe's engaging personality and experience in front of young students provide a comfortable and inviting environment for introductory Latin study. Simply put, there is no better way to introduce Latin to your children than through Latina Christiana I with Leigh Lowe as your instructor. These DVDs also include review lessons and assistance with difficult exercises. This gives you the skill and experience of our best Latin instructor in your home at minimal cost. Using Mrs. Lowe's video instruction, you can add Latin to your curriculum with zero additional prep time in your already busy schedule. These DVDs provide instruction to accompany the Latina Christiana I textbooks and often reference them. Latina Christiana I is recommended for grades 3-6. 5.5 hours on 3 DVDs. See also Latina Christiana I book set.